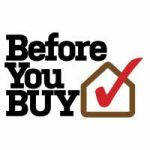 This article is part of a group of articles that we are calling the Pam Johnson-Bennett Series. Pam Johnson-Bennett is a cat behavior expert that is probably the most famous and sought after in the world. 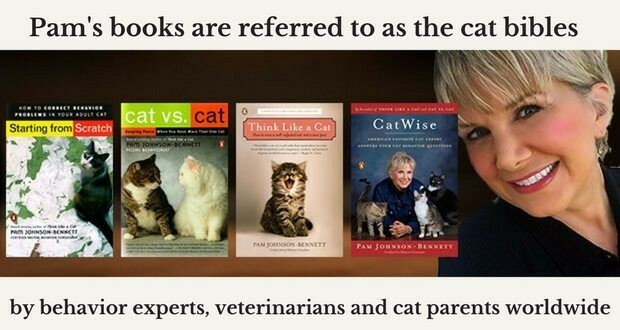 She has written many books like” Think Like A Cat” and her newest book "CatWise" and many more that address the day to day issues we cat lover's face. A multi-cat household can be a good thing. 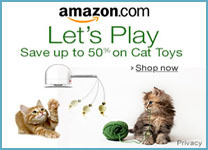 Cats learn how to interact and play together and develop bonds with each other. Introducing a new cat (bringing new cat home) into the home requires patience. Some cats take longer to form bonds and others may never warm up to each other. You do have some options to help your cats work out their disparities or even prevent disputes from happening in the first place. Note: behavior changes in a cat such as aggression, hiding, change in appetite, etc., can have a primary medical cause so have your kitties checked out by a vet before assuming a problem is behavioral. After bringing a new cat home, observe to see who hangs out with whom most of the time or whether specific cats tend to stay in one area of your home. When disputes happen, are they with the same cat each time? It may be a cat is not happy that another cat who really is not part of his group and who is trying to approach the litter box or get to the food area. 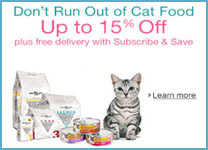 Two common mistakes Pam mentions; cat parents create a single feeding station for their multiple cats and they do not offer a good litter box set-up to guarantee safety. When it comes to the feeding station, cat parents may assume that because the cats are willing to eat close together they must be getting along just fine. The problem is (even with just two cats), the cats may be very stressed about having to eat alongside each other. Especially if this is the only location for the food and they are forced to be in close proximity of each other. 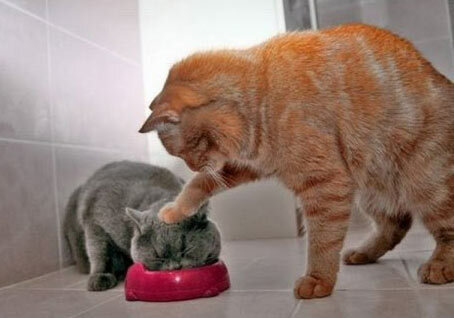 In this situation, you may also see one cat consistently bully one or more cats away from the food bowl as well. The lower- status cats may soon learn to stay away from the feeding area until the coast is clear. What a cat parent may view as the cats being social may actually be a situation creating constant stress. After bringing new cat home, do not assume your cats are getting along because they all come into the feeding area at mealtime. Your cats may not feel comfortable eating out of the same bowl or even eating right next to each other. Create some separation at mealtime to create a calmer environment. Regarding the litter box, Pam says; find some cat parents make mistakes in terms of number and location. 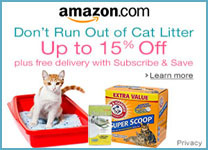 You should have more litter boxes than you have cats. Usually, one extra box is adequate especially when bringing the new cat home. 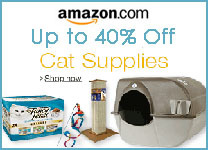 Resource location relates to other items like; Cat trees, scratching posts, perches and cat beds matter to the cats. If the only cat tree in a multi-cat home is located in a room controlled by a particular cat, then consider adding another cat tree or some window perches in other areas. One of the keys to peaceful co-existence in the cat world is the availability of resources. Do not put your cats in a position where they must persecute, defend or be in fear when it comes to eating, sleeping, scratching on the scratching post and using the litter box. Whether you are introducing a second cat or adding to an already established multi-cat family, take the time to do a measured, optimistic introduction. It is not about getting the new cat into the family immediately; it is about going at a pace that minimizes stress, fear, and worries of a threat. Need help with how to introduce the new cat when bringing new cat home? Click on the link below to get you started. One of the best ways to increase the size of the territories within your multi-cat home is to think vertically. Cats view their world in vertical terms and we, as humans, live in a horizontal world. Add cat trees (especially when bringing new cat home), cat shelving, cat stairways, window perches, and so on, in order to double and triple the size of territory for each cat. A multi-perched cat tree becomes a great way for cats to share space at the window while still feeling as if they are keeping enough distance between them because they are not right next to each other. 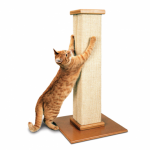 If adding a cat tree makes sense for your situation, check out our (Standard) and (Premium) cat tree reviews. In your new multi-cat family, there are cats that prefer to be visible and cats who feel more comfortable having the option to hide. 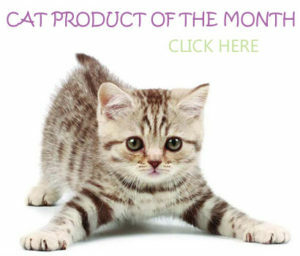 This is especially important for timid and fearful cats. By hiding in a special spot, they can view their environment safely. Hiding places can be in the form of boxes, tunnels, open paper type bags and even a cat carrier left open will do the job. Cats were born to move and hunt. Provide activities that prevent dullness, distract cats from getting aggressive with each other and encourage options for fun. When cats do not have anything to do, that is when they can start pushing each other’s buttons. One cat may be trying to seek some social play but another cat may interpret that as a non-friendly approach. If your cats are not getting along, it may be because someone feels threatened, is afraid, or the environment has not been set up to provide adequate resource distribution. Any kind of punishment such as yelling at the cats, squirting with water, swatting or time-out, will only serve to elevate their dislike of each other. Penalizing your cats can also result in a cat becoming afraid of you. Instead of penalizing kitty, become a cat detective and figure out the cause so you can set the cat up to succeed. When bringing new cat home, use behavior modification techniques to help lower the volume of multi-cat tension. As Pam mentioned earlier, it is important to figure out the cause of the problem. Once you know the reason, you can set up a behavior modification plan. That plan will include the above recommendations regarding resources and enrichment, but will also include you actively working with the cats to help them become more contented. In more severe cases, you may have to separate cats completely and do a total reintroduction as if they have never met before. 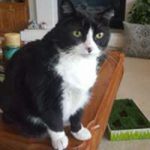 Clicker training can also be a big help in creating a training “road-map” so the cats learn what behaviors are rewarding and which ones are not. Remember; seek help from a certified trainer if nothing seems to work. I good place to start would be Pam’s website where she has a full array of techniques in her comprehensive book collection.